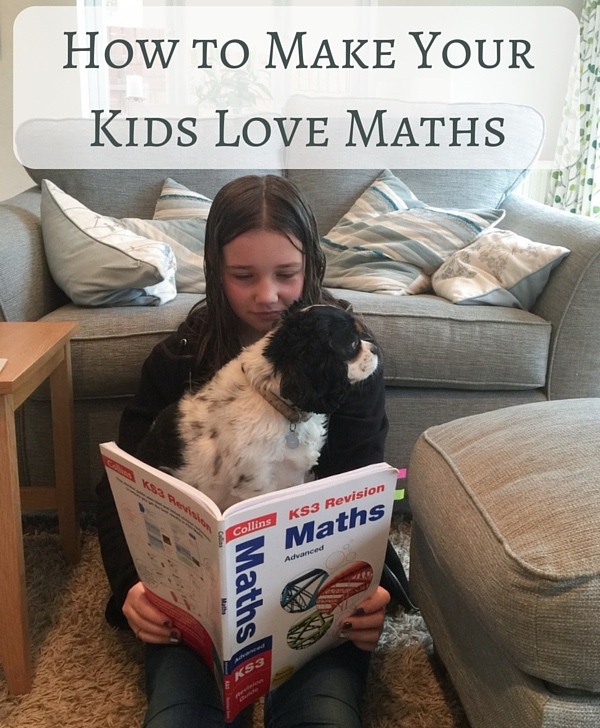 I once wrote a post called How to help your child fall in love with maths (even if they hate it) in which I talked about how my children learn maths without a curriculum. That was three years ago now. I’m pleased to say our approach is still going strong and that Cordie (12) and Jasper (11) love maths more than ever. Today I thought I’d reflect on what aspects of our maths approach have been most successful, then in my next post I’ll share in more detail what each of my kids are doing for maths right now and what our maths plans are for their senior school years. When it came to exams, I crammed a bunch of procedures into my head, passed with A grades, then promptly forgot everything. For the next 20 years I had nightmares about going into a maths exam unprepared and not being able to answer a single question. Over the years I’ve learned to anticipate their questions by encouraging them to work things out for themselves in the first place. So when Cordie wanted to know how the long division algorithm worked, we went in search of answers (thank you, Denise’s Cookie Factory Guide to Long Division). In geometry, most textbooks just present formulae for the area of shapes. But I knew that my children would want to know why these worked, so we figured them out for ourselves (see below for more details). And when we recently came upon trigonometry, Cordie not only wanted to know what this branch of maths was used for but also what all those strange words actually meant. Which was possibly the first time it had occurred to me that sin, cos and tan were anything other than magic buttons on a calculator that when pressed while reciting the appropriate incantation – ‘SohCahToa!’ – spewed out the correct answer. Of course when your kids ask questions, you need to . . . The best thing about not following a curriculum is that you’re never tempted steamroll over your child’s curiosity in an effort to finish a bunch of material by the end of term. 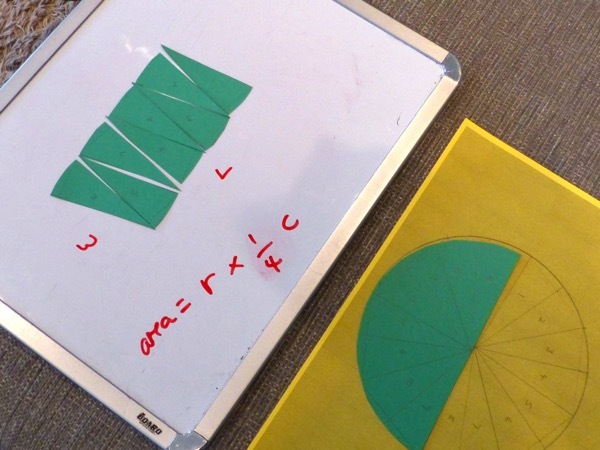 And you have time to investigate questions, like ‘What’s the area of a non right-angled triangle?’ Which leads to several weeks of playing with shapes as you figure out the relationships between rectangles, parallelograms, triangles, trapeziums and even circles. Which means your kids never panic about forgetting a formula, because they know everything follows from cutting up a rectangle. Having time to follow rabbit trails means you have time to explore questions like, ‘What’s trigonometry used for?’ Which leads you to research the history of trigonometry, from right back when ancient astronomers used it to calculate the positions of the stars, to how triangulation is used today in everything from MRI scanners to animation software. And when your daughter who’s passionate about linguistics asks where the words sine, cosine and tangent come from, you can spend a pleasant half hour discovering how ‘sine’, like the word used to describe our facial cavities (sinuses) comes from the Sanskrit word for ‘bowstring’. Of course, your child may not be as interested as mine in the etymology of maths terms, but by following whatever it is they are interested in, you’ll deepen their understanding of what they’re learning and make it more memorable. Since the early days of homeschooling right up until now when they’re 11 and 12, I’ve done maths alongside my children. 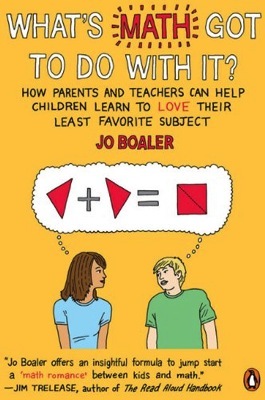 This is a controversial one, and I won’t pretend I’ve never casually suggested to my kids how useful it might be for them to rote-learn their multiplication tables, but they were having none of it. Jasper couldn’t see the point of memorising something he can quickly work out every time, and (like a lot of bright people) Cordie gets stressed by time pressure. So I decided I may as well trust mathematicians like Jo Boaler who says that not drilling kids on maths facts is a sure way to increase both their maths confidence and their number sense. Guess what? It worked! After years of having fun with numbers, neither of my children has a problem with doing rapid mental calculations – for numbers both below and above 12. In an ideal world I’d teach my kids sitting down nicely at the table as they write neatly using pencil and paper. I’m easily distracted and repetitive movement in my peripheral vision drives me crazy. However… as the adult I’ve had to adapt myself to accommodate how my kids learn best – on any given day. So if my son wakes up with the wiggles and wants to do maths while he leaps around on a giant ball, I take deep breaths, read problems aloud, and hold up a whiteboard for him. I used to worry that Jasper would never be able to be still enough to write out his answers, but I’ve noticed that when his mind is sufficiently engaged he’s quick to grab a whiteboard to draw a diagram or scribble some notes to help him figure out a problem. As maths gets more complex (and interesting) I anticipate him naturally doing this more and more. How do you do maths in your house? What approach to maths works best for your children? PS Bonus maths story – For a behind-the-scenes story about what maths is really like in our house, hop over to my blog about life in a family that embraces its quirkiness, Laugh, Love, Learn. PPS Remember my maths nightmares? I haven’t had a single one since I started learning maths this way alongside my children! 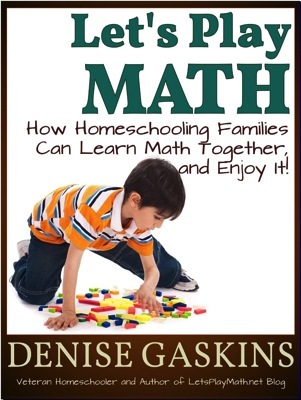 Let’s Play Math Denise Gaskins. A wonderful book all homeschoolers should read. See my review here. Teaching trigonometry Resourceaholic. When you introduce your child to trig, I highly recommend printing off a set of logarithmic ratios in table form before you reach for the calculator, and that you start out with the kind of approach outlined in this article. Animated explanations for area of basic shapes I can’t find the one we used, but this is very similar. We cut the various shapes out of coloured card. 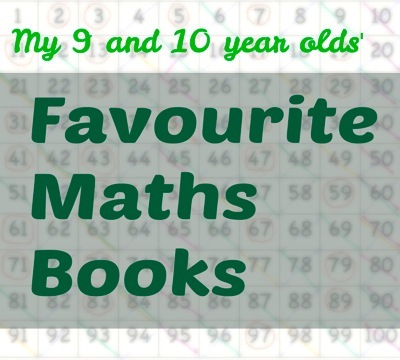 If your kids want to use the same maths book every day for months, is it their curriculum? If so, I might have to stop writing about how we don’t use one. Because lately, both C(10) and J(9) have been reaching for Becoming a Problem Solving Genius every time I suggest maths. We used another of Ed Zaccaro’s books for a short while when C and J were 7 and 8. Why did we stop? I think it was a problem of timing, and attitude – my own and theirs. We’d spent two years lurching from one maths curriculum to another in search of something that could sustain their interest. 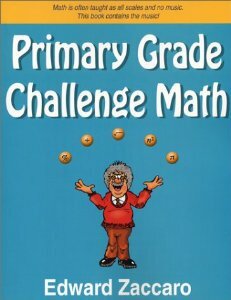 We probably approached Primary Grade Challenge Math with a weary ennui not very conducive to success. So what’s different now? Partly my kids are older, which means they can focus on trickier (more interesting) problems for longer. But I think it also has something to do with the maths playtime we’ve been enjoying for the last 14 months. During that time we’ve approached maths from many different directions. We’ve used stories, videos, number talks, games, puzzles, and many, many hands-on activities. (Sue Elvis wrote a great post about approaching maths “backwards” in this way.) As a result, my kids no longer think maths is about procedures and drills. For them, it’s about solving puzzles. And they know that maths is everywhere, not just on the pages of an arithmetic workbook. The main reason Becoming a Problem Solving Genius is such a hit with my kids is simply that the problems are so interesting and varied. On any single page there’s a delightfully wide range of different maths topics. 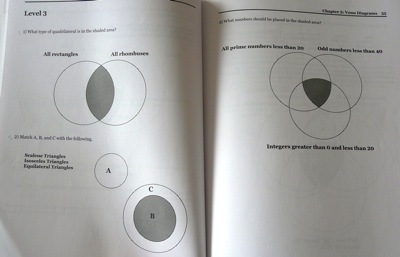 Yesterday, for example, J(9) worked through level 3 of the chapter on Venn Diagrams. The first three questions alone relate to (1) quadrilaterals, (2) triangles, and (3) prime numbers, none of which we’ve worked on recently. Knowing how J(9) likes to find things out for himself, I showed him our Maths Dictionary, where he looked up rectangles, squares and rhombuses. 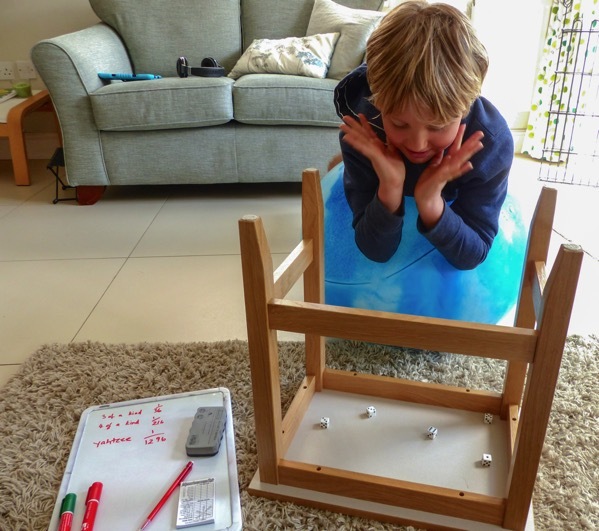 He then grabbed the Geomag and created quadrilaterals according to the definitions he’d read. 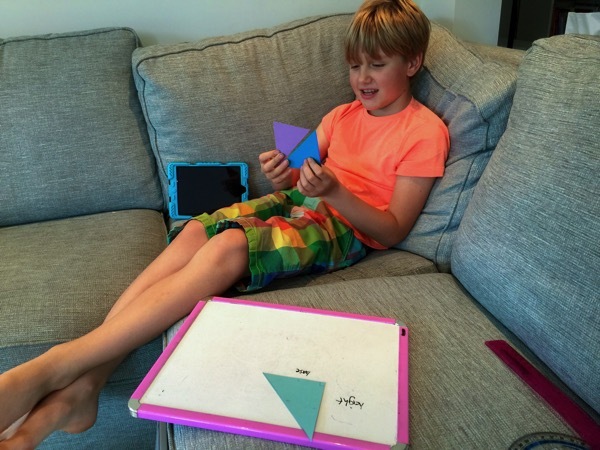 For the triangles question, he decided to draw as many different types of triangles as he could think of and then try to categorise them, before he looked up the definitions of scalene, isosceles and equilateral. When we got to the question on prime numbers, I showed J(9) the Sieve of Eratosthenes, after which he easily allocated the primes to their appropriate sets in the Venn Diagram. C(10) loved the chapter in Becoming a Problem Solving Genius on logic. (So did J(9), but after enjoying his delightfully “creative” answers I made a mental note to return to the chapter in a year or so!) And they both loved “Don’t be fooled (Counterintuitive thinking)”. Our success with Becoming a Problem Solving Genius inspired me to pull our other Ed Zaccaro books off the shelf. J(9) was beginning to struggle with the higher levels of some topics, so we switched to Primary Grade Challenge Math to consolidate and fill gaps in topics like decimals, square roots and percentages. 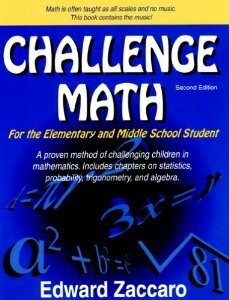 Then there is Challenge Math for the Elementary and Middle School Student, which is aimed at slightly older children. It, too, covers a huge variety of maths topics. I haven’t used Challenge Math with either of my kids yet, but I’m going to show it to C(10) soon. I think she’ll like it. The contents range from decimals, fractions, percents and area to acceleration, simultaneous equations and astronomy! In my last post I also promised to share our thoughts on Khan Academy maths. Khan Academy represents a massive step forward in open source learning. It makes maths education available to a many, many people who wouldn’t otherwise have access to it. And I’m sure it compares favourably to curricula people pay hundreds of pounds for. It’s is a very flexible resource. 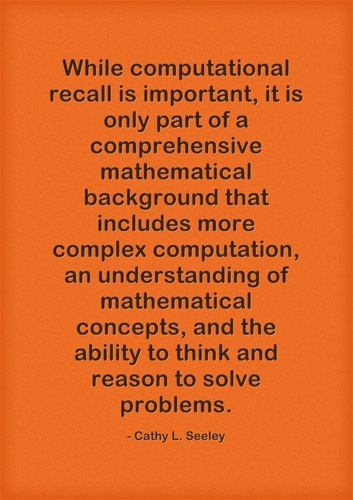 You can choose to learn recreational math, or math by grade level, or a variety of skills at once, in World of Math. Or you can focus on higher level skills like trigonometry or geometry. It’s possible to switch between options at any time. Earlier this year I wondered if Khan Academy might be the ideal way for my autodidactic 9-year-old to learn maths. He agreed to give it a go, and at the same time I decided to use Khan myself to review what he’d be covering. I also thought it would be useful to look at what C(10) “ought” to be able to do (since we weren’t using a curriculum) and to brush up on my own maths skills. I used Khan Academy every evening for several weeks, and by the end I was in complete sympathy with J(9), who was grumbling about how boring it was. The material is dry, lacks context, and the problems involve the same sort of abstract, unlikely scenarios that have blighted maths textbooks for decades. This is not a living maths curriculum! Having said that, I’m not completely discounting Khan Academy as a resource. Firstly, I’m using it to review topics my children are learning. By working through their respective grade levels I can remind myself of what they “should” know and make a note to fill any gaps (including in my own skills!). Secondly, the videos are useful when you want to quickly learn or review a specific concept. For example, when C(10) was working out the area of rectangle recently, she wondered, “So how do we calculate the area of a triangle?” I remembered the formula half × base × height, but C(10) always wants to know “why?” and I wasn’t sure I could answer her. A short Khan Academy video gave me of the mathematical proof I was looking for and I was able to explain it to C(10). C(10), by the way, didn’t try Khan Academy. She was enjoying our buddy maths too much to contemplate giving it up. Perhaps we’ll come back to Khan Academy when the children are older, but for now it’s not for us. How about you? Have you tried Khan Academy or Mr Zaccaro’s books? What works best for your family? I’d love to hear about your experiences. Read more about how we do living maths here. This post contains affiliate links. I purchased my own copies of all the books. In my last post I described J(9) as fiercely autodidactic, which makes me giggle because it’s so literally true. J(9) is bright, funny, creative – and very independent. When you add in the emotional regulation challenges that come with Sensory Processing Disorder, you have a child who keeps homeschooling life very interesting. Like his sister, J(9) didn’t get on with any maths curriculum. We stopped looking for one that worked a long time ago. He happily joins C(10) and me for maths stories and hands-on activities, but until recently it was impossible to do one-to-one maths with J(9). I’ve heard enough stories about unschooled kids and maths to know that he’ll get there in the end. 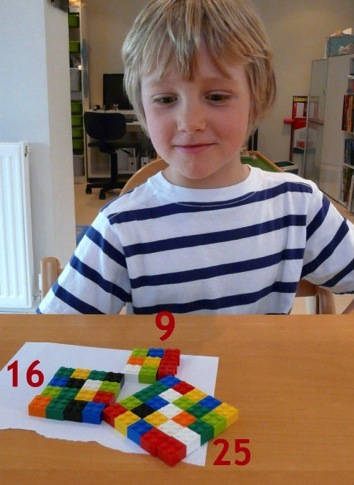 J(9) has a natural aptitude for numbers – he knows most of the multiplication tables without ever having consciously learned them, for example. So I didn’t worry about his long-term future. But maths is fun, and I didn’t want him to miss out. An obvious solution for someone who doesn’t like to be taught is to use a self-teaching curriculum. Unfortunately, J(9) finds these boring. I sympathise. It’s difficult to bring out the joy of real-world maths in a self-teaching curriculum aimed at 9-year-olds. I thought, briefly, that Khan Academy might be an exception. I liked how its maths curriculum is laid out, and the sophisticated way coaches can monitor pupils’ work. Unfortunately, Khan Academy didn’t work out for J(9). I’ll share more about that in my next post. One of my favourite homeschool mum roles is detective. I love quietly observing my children, gathering clues about how I can support their learning. I considered what I knew about J(9) and maths. He has strong spatial skills and likes playing with numbers. He’s easily bored, and to focus his mind he often needs to move his body. He loves puzzles and games – but if there’s one thing even more likely to trigger a meltdown than making a mistake, it’s losing at a game. We’re working on these challenges. I know about the importance of a growth mindset, and one day I hope that J(9) will see the value of mistakes, too. In the meantime, I relied on my own growth mindset. I took everything I’d learned from each of our maths “failures” and just kept on trying new ways to work with J(9). It only occurred to me recently, looking back over the last few months, that we seem finally to have found our groove. What has evolved for us is an extremely relaxed version of the buddy maths I do with C(10). Maybe “relaxed” isn’t right word. “Mindful” might be a better description of my role in the process. Here’s how it looks in detail. 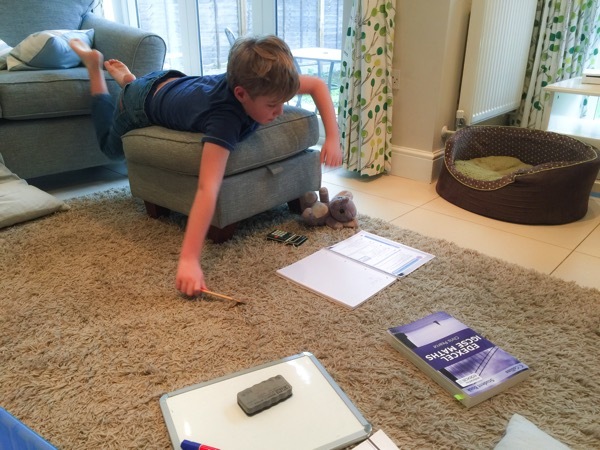 Where we do maths – We take our book, together with whiteboards and markers, to the sofa. Topic of the day – J(9) picks a chapter. We rarely follow books sequentially, though we often continue with the next level of problems in a topic we left off last time. Time of think – One of us reads out a problem. Then I stay quiet and give J(9) time to think. I only offer hints when he asks for them (I’ve learned this the hard way). Instead, I take deep breaths and remind myself that crawling under the sofa being a snake, or jumping on top of it like a monkey, helps him concentrate. Writing things down – If I don’t instantly know the answer to a problem, I use a whiteboard to figure it out. J(9), ever independent, doesn’t look at my workings. His brain works differently from mine and he often mentally calculates things I can’t. Dealing with mistakes – J(9) tells me his answer when he’s done. Whether I agree or disagree, I set my voice to neutral and ask, “How did you get that?” If he’s made an error, he often spots it as he explains his process. He can then change his answer, so he doesn’t feel like he’s got it “wrong”. Occasionally, when we get different answers, I realise I’ve made a mistake. J(9) likes it when that happens. If I’ve got the same answer via a different process, I ask J(9) if he’d like to hear how I did it. Then I try to respect his answer! He’s gradually learning that one tends to make fewer mistakes using simpler processes, but if I’ve learned not try to foist a method on him. And, I admit, there are still times when J(9) can’t see where he went wrong, doesn’t want to talk about it, and he ends the session early, frustrated. I’m learning not to get upset when that happens – it doesn’t negate the learning that’s gone before. We’ll come back to the topic another time, when he’s ready. When are we done? – There’s no minimum time for our sessions or number of problems we do. We might do one question or thirty. J(9) is in control of his learning. One-to-one maths with J(9) has transformed from something we both dreaded into an absolute pleasure (mostly). I’m hopeful that our buddy maths routine will continue after we’ve exhausted the questions in Becoming a Problem-Solving Genius. Perhaps we’ll move on to Murderous Maths or try out one of the many great sources of maths videos. I’ll let you know. Perhaps the best outcome of our new way of doing maths is that J(9) is beginning to trust me as his learning mentor. I know he will always want to learn as independently as possible. As he gets older that’s not necessarily a bad thing. But I want him to know he can always come to me for help and support. Back in January I shared our maths plans for this term. Our plans are always flexible. One of the joys of not following a curriculum is that if something isn’t working we can switch topic or try a different approach. Maths with one of my children has far exceeded my hopes and expectations this term. C(10) has matured in so many ways over the last six months, and being her maths mentor has become a real delight. She’s developed genuine enthusiasm to engage with mathematical ideas and persist with challenging problems. And she’s always willing to listen to my suggestions for improving her working methods. We started in January reading Awesome Arithmetricks, whiteboards to hand. 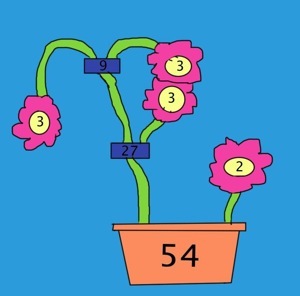 This worked well as a recap of addition and subtraction (with some fun interludes like this simplifying equations puzzle). Awesome Arithmetricks also explained long multiplication in a way that made sense to C(10). So what did I do? I did what I always do when one of my kids asks a tricky question – I turned to google. “How does the long division algorithm work?” I found plenty of helpful websites, but – to be completely honest – I didn’t follow many any of the explanations! I didn’t panic. You really don’t need to be a maths genius to teach your child maths without a curriculum. I’m certainly not! If I’d devoted a bit of time to understanding how the long division algorithm works I’m sure I would have got there. But I decided it would be more fun to figure it out alongside my daughter. C(10) knows my attitude to learning maths. She knows that I got top maths grades up to “A” level but that I mostly learned by unquestioning memorisation, rather than fully grasping the mathematical concepts. She trusts me, not to know all the answers, but to help her discover them for herself, in a way she deeply understands. At this stage of her maths education it would be easy for me to swot up in advance and pretend I know it all. Instead, though, I’m aiming for a long-term approach which will create a foundation of trust. A foundation which will, I hope, continue through our homeschooling days, as C(10) becomes more independent but continues to trust me as her learning mentor. So what did we do about long division? 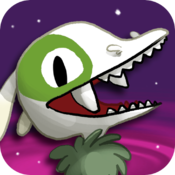 I downloaded Math Mammoth’s Division 2 which teaches long division in several small steps, over many lessons. C(10) completes the exercises on her iPad using Notability. A side benefit is that she’s been getting lots of multiplication fact practice. Division 2 is great value at $5.10 for 70 pages of well-structured teaching and practice. I’m sure by the time we’ve completed it we’ll both know everything there is to know about the hows and whys of long division. But there was no way C(10) was going to work through 70 consecutive pages of division and emerge with her love of maths intact. So, we’re taking our time. Each day I ask what she’d like to do for maths. Usually a few times a week she chooses to work on Division 2. Other times we do something different. We have plenty of resources – many of them free – to choose from. Here are some we’ve enjoyed this term. This SATs-papers website contains all the past test papers sat by English schoolchildren. I usually take one look at SATs papers (especially science and English ones) and run a mile, thanking our lucky stars that we home-educate and my kids don’t have to waste their time on this kind of stuff. But we love the KS2 Level 6 Maths problems. These questions are deceptively short but they all require thinking, and that’s why C(10) loves them. You can download as many SATs papers as you want, you just have to register (free). 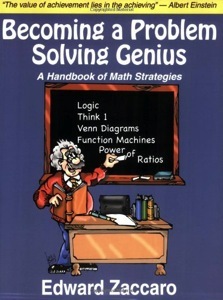 Like Primary Grade Challenge Math, Becoming a Problem Solving Genius is made up of short chapters, each of which introduces a topic in a fun way and is followed by four sets of problems which range in difficulty from “easy” to “super-Einstein”. While we love the problems in this book, we find some of the strategies a bit formulaic. C(10) likes to have a go at the problems and then refer back to the notes when she needs a pointer. As with our multiplication facts approach, this seems to me to be the most sensible order of doing things. Instead of being told how to do something and then being tested on it, don’t we learn better once we’ve experienced a need for a piece of information or technique? Measuring Up (free download) is another source of interesting games and problems on subjects ranging from probability to geometry. Each of the 13 exercises is followed by an explanation of what it has been designed to achieve. Examples of high, medium and low level responses are also given. We just enjoy the puzzles! When The Man Who Counted popped through my letterbox I briefly wondered if Amazon had sent it by mistake, or perhaps as a bonus for my generous contribution for their bottom line. 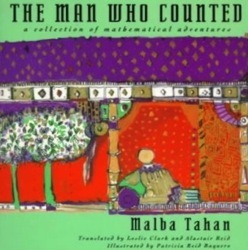 When my brain finally clicked into gear I remembered coming across it on Math Mama Writes‘ list of a dozen delectable math books. 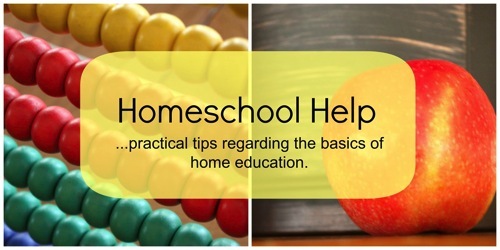 Highhill Homeschool has been sharing a wonderful series of posts based on the geometry of circles. Their most recent activity was based on Islamic Art and Geometric Design from the Metropolitan Museum of Art (yet another free download). This ties in perfectly with our forthcoming trip to Spain, where we’ll be visiting the Moorish palace, the Alhambra. 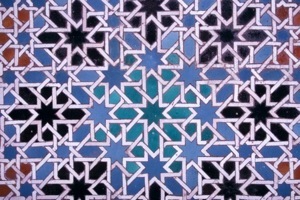 We’ve enjoyed looking at photos of the exquisite geometric designs at the Alhambra. And C(10) has found a reason to learn how to draw circles with a compass. We’re looking forward to moving onto finding geometric shapes within our circles. 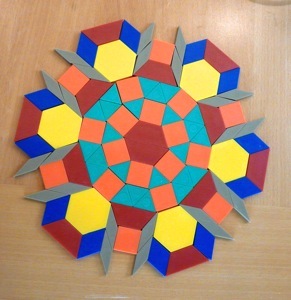 Do you have any fun maths resources to share? Do you have projects pinned that you’ve been meaning to do for years? 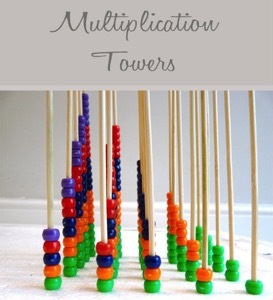 Multiplication towers was one of mine. When I first saw them on The Map is Not the Territory I knew we’d all learn something from playing with this 3D multiplication model. The catalyst for getting around to it was a Christmas gift. My lovely parents-in-law sent us some fine meat which arrived from Scotland packaged in polystyrene and dry ice. The steaks were delicious – but you know you’re a homeschooler (or a toddler) when you get even more excited about the packaging than the gift itself. Yes, that giant slab of polystyrene was the perfect base for our multiplication tower. Here’s where my learning curve began. (Skip this bit if you are an instructions-reader, you won’t get it.) You know how you sometimes start gathering materials for a project without consciously thinking it through? So I had my polystyrene base, a pack of beads, and now I needed some skewers. How many? I thought of the multiplication grids we’ve been working on recently. Should our multiplication tower go up to 10 x 10, or all the way to 12 x 12? “Oh, why not go for it?” I thought, throwing caution to the wind and putting two 100 packs of bamboo skewers in my basket. Back home, I used a sharpie to mark out a grid of 144 dots on the polystyrene. 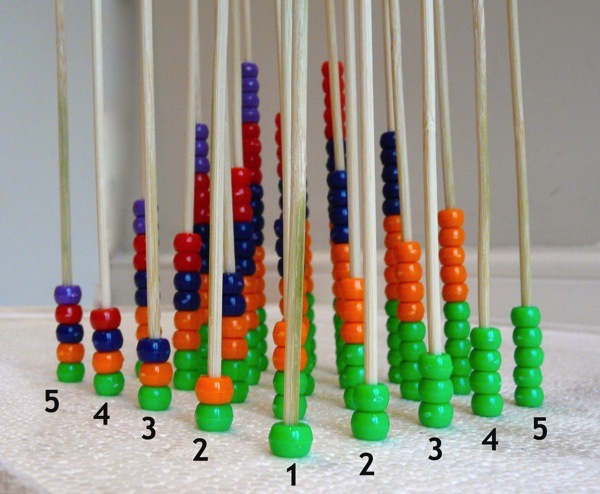 It wasn’t until I began inserting the skewers that I saw the flaw in my plan, and realised that (a) no skewer would be tall enough to hold 144 beads, (b) the 12 times table alone would use up almost all our 1000 beads and (c) as enthusiastic as my kids are about hands-on maths, I may not be able to persuade them to spend a week threading beads. At this point it occurred to me to refer back to the project, where I discovered that Malke made a 5×5 multiplication tower, requiring 225 beads. Good idea. I thought about making the model myself first, to make sure I understood how it worked. But after a few beads I remembered that sometimes a student learns more if the teacher doesn’t know all the answers. 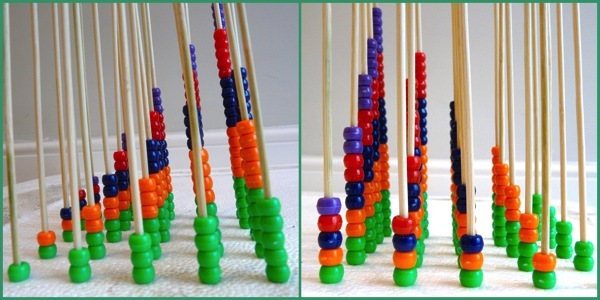 Of course this isn’t difficult maths – many people make multiplication towers with slightly younger kids as an introduction to the concept – but it does get you thinking logically about number patterns and the commutative property. I showed J(8) the Lego multiplication tower Frugal Fun for Boys made. He enthusiastically set about gathering 2×2 Lego bricks to make his own. He only had enough bricks to make up to 4×4, but it was enough to get the idea. When we compared C(10)’s bead tower with J(8)’s Lego one, we noticed they were different. In our bead tower we had used the same colour beads for the “ones” on both the x and y axes, as they did at The Map is not the Territory. In the Lego tower, we had used different colours for each “one” on the y axis (as Frugal Fun for Boys did). So in the photo above, on the x axis we have a blue Lego for “1 one”, two blues for “1 two”, three blues for “1 three” and four blues for “1 four”. 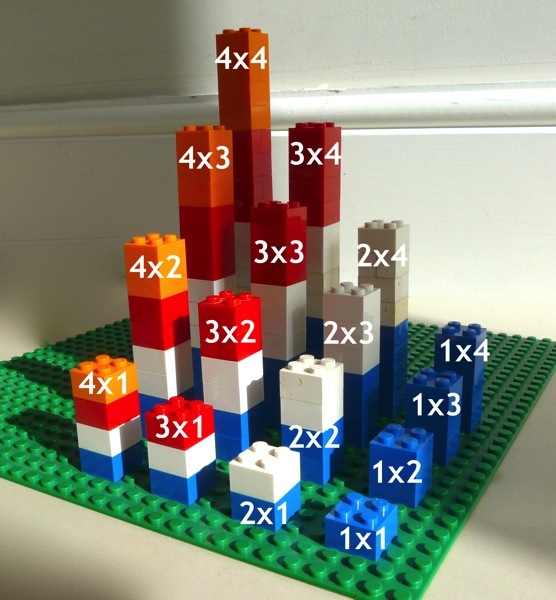 Meanwhile, on the y axis, we have one blue and one white Lego representing “2 ones”, a blue, a white and a red for “3 ones” and a blue, a white, a red and an orange for “4 ones”. The children and I discussed the two models, and decided the Lego model made more sense to us. C(10) changed her bead tower. More great learning. Next, C(10) decided to make a multiplication tower on Minecraft. You can’t write numbers on Minecraft so she decided to use colours to represent the numbers (the small dark blue blocks along the axes in the picture below). She spent some time viewing the tower from different angles in a way that made me slightly dizzy. 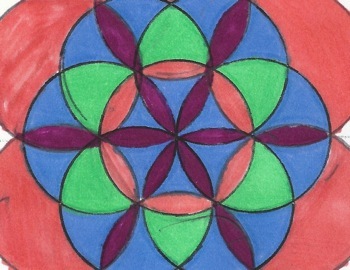 At one point she exclaimed, “Hey, look at this pattern here, on the diagonal – 1, 4, 16, 25!” She’d discovered the squares. 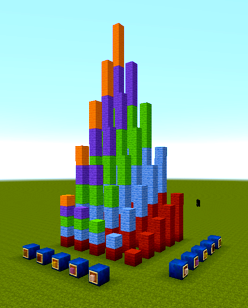 C(10)’s Minecraft tower reminded me to show her the computer-generated multiplication towers at Moebius Noodles. Click over to see quite how high 12×12 multiplication towers get. If you don’t have a polystyrene or foam block, you could perhaps use sand to support the skewers, or follow the example of Highhill Homeschool and use cotton. Or make a Lego tower. 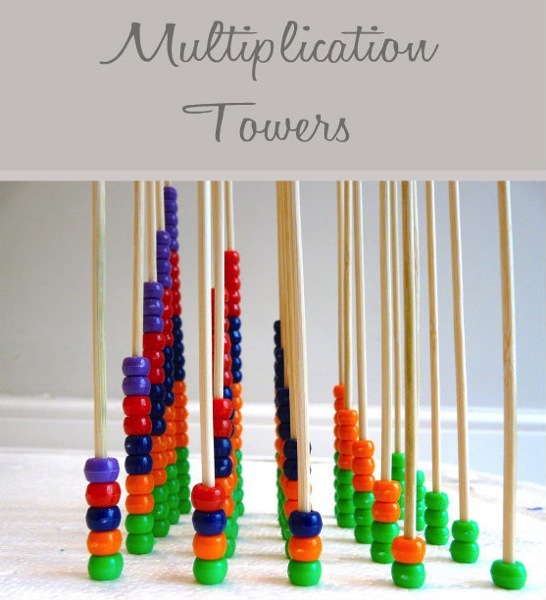 Have you ever made a multiplication tower? Did you learn anything surprising? My children (8 and 10) don’t spend as much time doing sums as other children. Whereas most elementary maths curricula focus on arithmetic, we work on a balance mathematical skills, including critical-thinking and problem-solving. One of my main aims is to stimulate my kids’ interest in and passion for maths. But I do want my kids to be number-confident – they need to be able to use arithmetical algorithms. I have two priorities here. I want them to be proficient at using algorithms (to accurately follow step-by-step procedures). I also want them to know how the algorithms work (why they are using them). 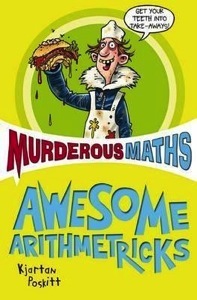 Murderous Maths: Awesome Arithmetricks is the perfect way to review arithmetic skills and develop number sense. C(10) and I are reading the book at the moment. We enjoy the jokes and the story, and stop to practise procedures whenever we need to. Awesome Arithmetricks is divided into four sections – addition, subtraction, multiplication and division. But it contains a lot more than the basics. Examples are given within entertaining stories, and questions are posed as puzzles. C(10) enjoyed this puzzle so much she worked through it several times over the course of a week. C(10) worked through all the levels of the app a few months ago (for fun). So, after we’d read about simplifying equations in Awesome Arithmetricks, we played with a few algebraic equations. C(10) enjoyed solving them using what she’d learned playing Dragon Box Algebra and reading Awesome Arithmetricks. 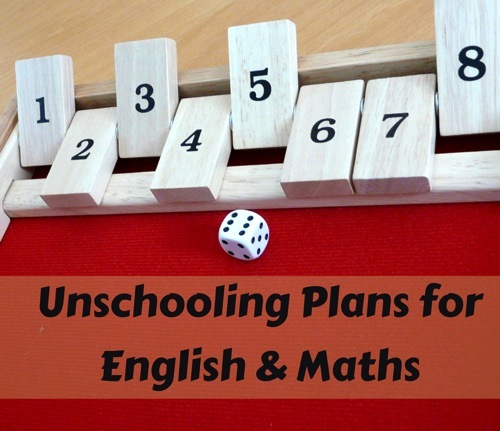 Unschooling plans? Is that an oxymoron? I was going to say “unschooling ideas” but that sounded too vague. Call them what you will – over the last few weeks I’ve been chatting with the children about what they want to learn this term and jotting down ideas in Evernote, and that’s what this post and the next are about. Today, I’ll share our plans for maths and English. Next time I’ll talk about history, science, projects and extras. Without a maths curriculum, how do I know what to cover with C(10)? When I come across a topic I think C(10) will enjoy learning about (or revisiting) I look it up in our collection of maths books. 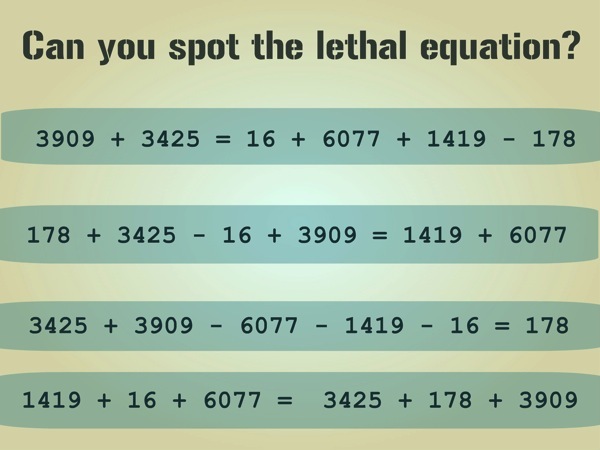 We especially like the Murderous Maths series at the moment. 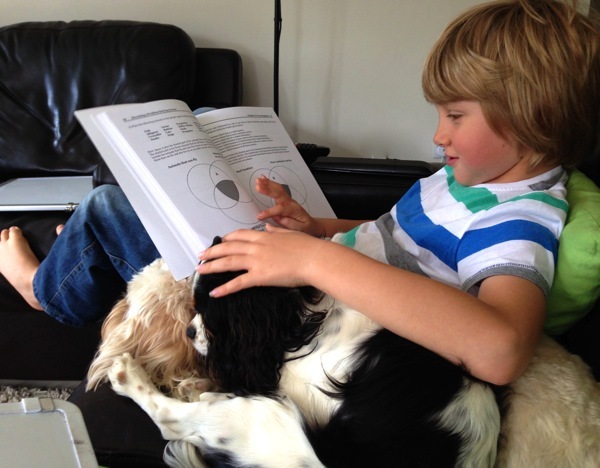 I usually read aloud, pausing while C(10) – beside me on the sofa – works through problems on a mini-whiteboard. I also scan our favourite maths websites for games and hands-on activities relating to the topic. Two new (to me) resources I’m looking forward to exploring this term are Mathtrain.TV (loads of short maths videos, mostly made by children) and MathForum (hundreds of links to maths websites and activities). For the moment J(8) wants to continue working through Life of Fred. As we progress with the elementary series I’m inclined to agree with Hwee that this series has a few flaws. This has particularly struck me in our current book, Life of Fred: Ice Cream, which focuses heavily on learning the times tables by rote and introduces concepts like perimeter and graphing in a dry and confusing way. However J(8) loves the Fred story and as it doesn’t form our entire un-curriculum, I’m happy to stick with it for now. He prefers his maths a bit less seat-of-your-pants than C(10), so it works for me to try out new things with her, knowing I can do them with J(8) later when I’ve ironed out the wrinkles. In the meantime we include J(8) in any games, stories and fun hands-on activities we do. English (language arts and literature) is the subject I feel most relaxed about leaving to the children. Over the years I’ve become convinced that the single thing that makes the most difference to their proficiency in the English language is books. Not spelling and grammar workbooks, or learning how to construct a paragraph, but books with stories they love. Books improve my children’s vocabulary, spelling, grammar and writing voice and style, not to mention their debating skills, critical thinking and general knowledge. There’s plenty of time for them to learn to write essays; for now I want to give them time to develop their own voices, inspired by the books they read and listen to. As a former lawyer I’m also a stickler for accurate punctuation; however I believe this, too, will come easily and naturally when the time is right. As usual we have many audiobooks on the go. Together we’ve just started the fourth book in the Hitchhiker’s Guide to the Galaxy series, So Long and Thanks for All the Fish (warning: contains some scenes between a man and woman you may not want your kids hearing. J(8) drifts off during the “sappy bits” which in any case are general enough to go over his head, and C(10) is mature enough to handle them, so this doesn’t bother me personally). J(8) has asked to learn about the world wars this term, so I’ve got The Silver Sword lined up for us to listen to together next. Meanwhile, on their own, J(8) is re-listening to the Kane Chronicles and C(10) has just started reading The Underland Chronicles series (by Hunger Games author Suzanne Collins) while she waits for the fourth Heroes of Olympus book to arrive at the library. Over the Christmas break we finished an excellent trilogy which prompted some very stimulating discussions about human nature, war and politics. I’m not going to mention the title (it’s not The Hunger Games) because I don’t want you to think I’m recommending it for eight-year-olds, but once I’ve formulated my thoughts I might be brave and write a post about it. Both my kids loved the books, and the listening experience really brought home to me how valuable fiction can be for deepening children’s (and adults’) understanding of complex real-world issues. I’m intending to use Brave Writer’s Daily Writing Tips: Volume 1 for inspiration, especially as a springboard to write alongside J(8) who has suddenly taught himself to spell (two years after we gave up spelling lessons and six months after we stopped his phonics programme. There’s a lesson for me there). It’s a joy witnessing J(8)’s emerging written self-expression, not just for its own sake but because his writing is just so funny. Last week I was sitting alongside C(10) as she wrote Christmas thank-you emails. Her messages were polite, well-spelt and punctuated, and followed all the usual thank-you note conventions. Then J(8) joined us. I started out typing for him but he soon seized the computer to stop me editing what he wanted to say. We were soon all snorting with laughter at J(8)’s idea of appropriate greetings and thank-you sentiments. I’m not sure what J(8)’s kind relations and godparents will make of his thank-you notes, but I can be sure they won’t be receiving many others like his! It won’t take long for J(8) to learn how to formulate his written thoughts into exam-ready paragraphs when he needs to do so. 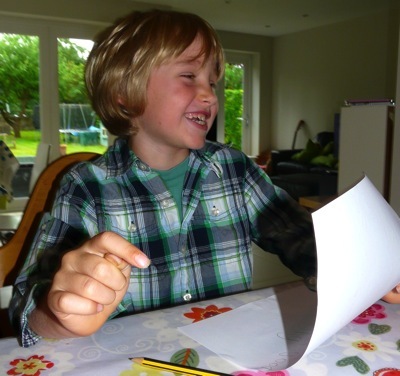 J(8)’s written voice is just beginning to emerge as the perfect expression of his exuberant, off-the-wall personality. To attempt to squash it into a rubric-constrained framework, before it’s had time to fully develop, would be a tragedy. C(10) will continue her writing sessions with her tutor, the homeschooling mum friend who first introduced me to Brave Writer. C(10) thoroughly enjoys these sessions and I’ve seen wonderful developments in her writing style since she began them. I’ve also noticed that she’s been writing more often spontaneously recently – stories, notes and a very detailed dream journal. We’ll also continue daily(ish) copywork, poetry teatimes, word and writing games and our read-aloud chapter book. We might read Puddles in the Lane next. I remember loving this story of evacuated children when I was ten, and it will fit well with J(8)’s request to learn about the World Wars. More on that, and our project plans, next time! In England, maths is the second most hated subject in schools, second only to science. Most homeschooled kids I know love science. Why? Because they learn science in a fun, hands-on way that bears little resemblance to the dry textbook science of most schools. But I’ve heard of more than a few homeschooled children who dislike maths. 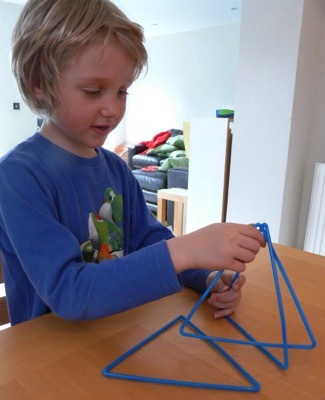 Which begs the question – why don’t homeschooling parents share the joys of maths with their children in the same way they do science? The answer, sadly, is because of how most adults were taught maths. Whether they hated maths or excelled at it, most people have no idea what real mathematics is. I know I didn’t. I was one of those kids who enjoyed maths at school because I was lucky enough to have a good memory. That, combined with a competitive streak, got me A’s through to age eighteen. At that point I quit maths and ran for the hills, amazed I’d managed to make it through to the end without anyone finding out that I hadn’t a clue what all those symbols actually meant. It wasn’t until three years into homeschooling my kids that I began to get a glimpse of what maths really is. I’m still at the start of this journey of discovery so I’m certainly no expert, but I’d love to share with you some of what I’ve learned so far. I can’t imagine any child who knows what real maths is finding it boring. Maths is not about memorising a bunch of dry facts and procedures. Memorisation may have its place, just as learning vocabulary does. But it bears no more relation to real mathematics than a list of French verbs has to the lifetime works of Victor Hugo. Just like music and painting, maths is an art – the art of making patterns with ideas. Real maths is a fascinating process of creative discovery. And what child doesn’t enjoy engaging their curiosity as they play with ideas? To fall in love with maths, your child has to know what maths really is. And you can’t show them unless you know what maths really is. The good news is, you can start to think like a mathematician in just twenty minutes. After that you can just jump in and learn alongside your kids. 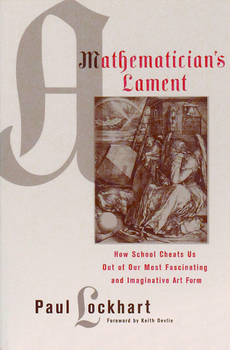 Read A Mathematician’s Lament (links to a free 25 page PDF). The twenty minutes it will take you to read might be the best homeschool investment you ever make. 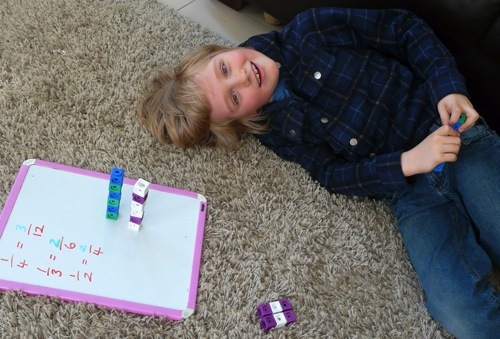 Let’s Play Math: How Homeschooling Families Can Learn Math Together, and Enjoy It! Read this first if you’re keen to get started doing real maths with your kids, especially if they are elementary age. I wrote about Let’s Play Math in detail here. The Elephant in the Classroom: Helping Children Learn and Love Maths (titled What’s Math Got to Do With It? in the US). 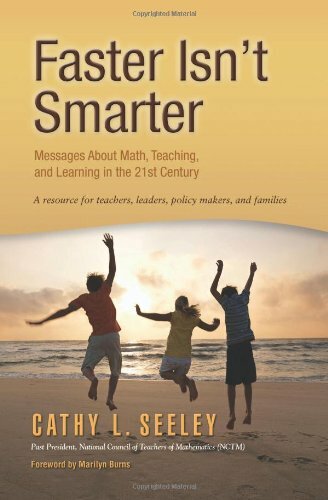 Jo Boaler, a maths professor at Stanford University, has conducted extensive, long-term research into how children learn maths. The approach she outlines in this book teaches all children to think and problem-solve – even those who think they’re maths failures who could never enjoy maths. After you’ve read these, I guarantee you’ll be excited to share what you’ve learned with your children. You may be a little overwhelmed about where to start, but don’t worry, there are plenty of options. 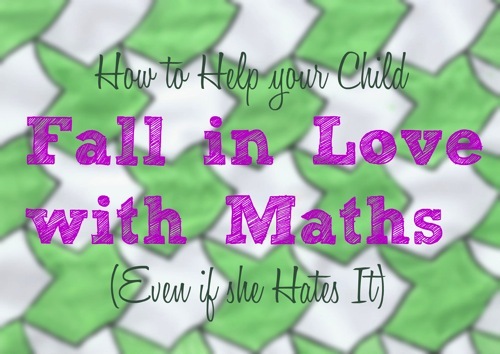 And really, it doesn’t matter what part of maths your child falls in love with first. 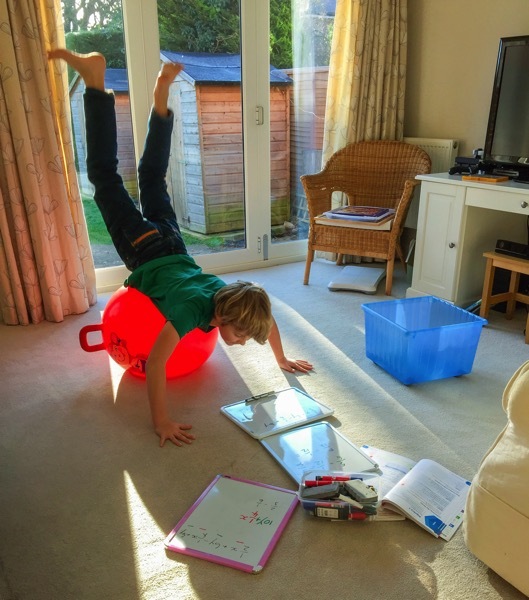 Just jump in – or if you’re an organised type, make a one month plan of fun maths activities, and get stuck in. 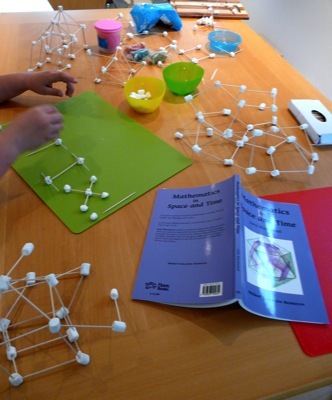 Many parents integrate maths play-days into their homeschool schedule alongside their regular curriculum. If your curriculum is working, this can be a good approach. All children will benefit from the opportunity to play with real mathematical ideas, even if they love their curriculum. 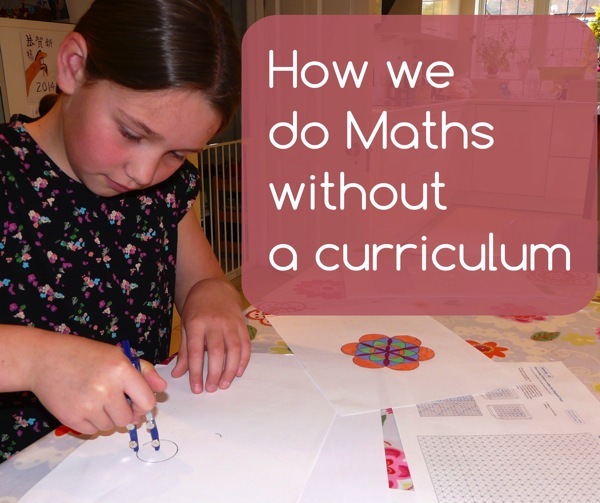 But if your child hates maths, don’t be afraid to ditch the curriculum – at least for a while – and jump into mathematical fun. You don’t even have to call it maths. My own kids have always been mathematically able, but neither got on well with traditional curricula. We tried Singapore Math and Math Mammoth. Each worked for a while but didn’t last. It was frustrating at the time, but I’m grateful now for my kids’ honesty – without it, I might never have discovered the joy of real maths. We’d always read maths stories and done a few hands-on activities, but too often these got pushed aside as “extras” when we were trying to get through the curriculum. Then, six months ago, we began a one-term living maths experiment, which worked so well we’ve made the change permanent. What about tests and exams? In answer to that question, consider this story of two girls, Lilly and Katy. Lilly is twelve years old. Her mother knows how much pleasure playing a musical instrument can bring, so she surrounds Lilly with beautiful music and encourages her to take up an instrument. Lilly chooses violin, and soon enjoys playing simple tunes. Her enjoyment inspires her to play more often. As her love of music grows, Lilly decides she wants to learn about time signatures and note values, key signatures and scales – all the while learning to play more and more complex works. Lilly enjoys her music so much that she even begins to compose her own little pieces, transcribing the notes onto staff paper and transposing the songs into different keys to share with her musician friends. Katy is eight years old. Her mother, Tracey, has been told how good it is for children to learn music. And she knows that it will be useful for Katy’s future to pass her musical theory exams at age sixteen. So Tracey has Katy get out her staff paper each day and copy notes from a book, making sure she gets her clefs and key signatures right. Tracey reminds Katy how important it is to neatly fill in her quarter-notes and get all her stems pointing the right way. 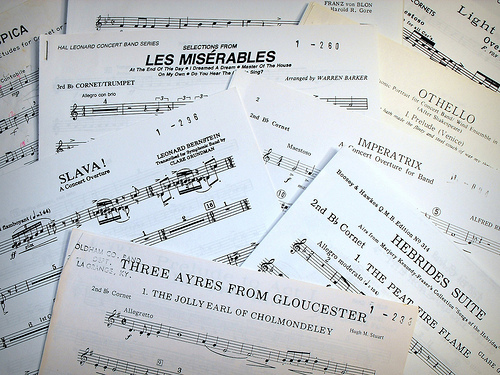 Katy is told that once she has a thorough grounding in music notation and theory and has passed her music theory exams, she will be allowed to listen to and play music – perhaps when she is at college. Katy grows to hate this boring subject called music, and to Tracey’s frustration begins to dawdle longer and longer over her work, preferring instead to stare out of the window and hum tunes to herself. Which girl will pass the exam? Which girl do you think will do best in her musical theory exam at age sixteen? Katy, who has spent eight years learning dry musical theory – which she has come to hate – but has never heard a melody? Or Lilly, who spent four years making and enjoying real music, and who was inspired to learn its technical language along the way to enhance her enjoyment even more? If children are allowed to experience the creative art that real maths is, everything else will fall into place much more easily. Once you’re in on the secret of what maths really is, you’ll begin to notice opportunities for maths play everywhere. 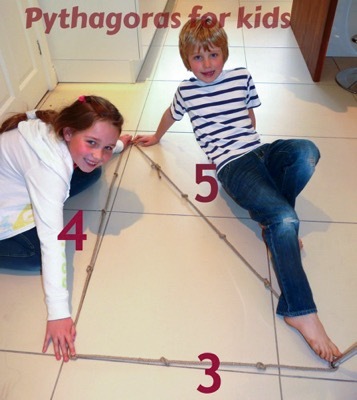 Let’s Play Math is a great place to start finding concrete activities to do with your children. Before long you’ll be solving puzzles, playing games, crafting intricate geometric shapes, reading biographies of great mathematicians, cracking codes, learning from videos, getting acquainted with the maths section of the library and generally having lots of fun while you develop your mathematical muscles. All these blogs contain links to other real maths activities. Enjoy the rabbit trail! Every Bed of Roses – Math is a Problem – Now What? We started last year using a combination of workbooks and Life of Fred, and we ended it with a full-time living maths experiment inspired by Denise Gaskins’ Let’s Play Math. I’m pleased to say that the experiment has been a huge success and we plan to continue with it next year. I prefer routines to structured schedules so our plans are loose. 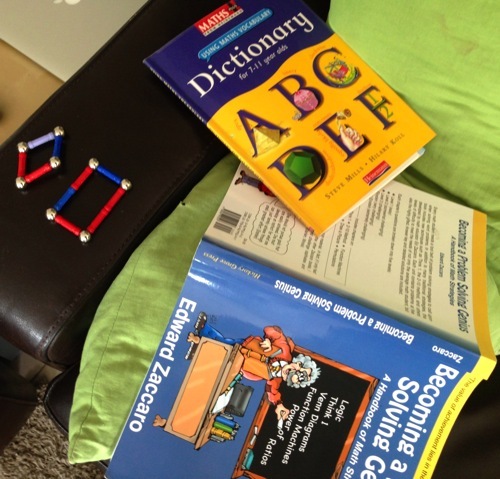 Some days J(8) likes more structure – on these days he asks to use Life of Fred which we read together. I try to balance the kind of activities we do over a week, and tailor the day’s activity to our mood. If we get caught up in a long project like discovering pi I don’t worry about fitting in anything else. I usually do maths with each child separately, though often the other will join in when they see us playing a game or swapping story-problems. We grab a few puzzles or problems, settle ourselves comfortably on the sofa with a whiteboard and dry-wipe marker each (and usually the dog. He likes living maths) and get to work (play). Sometimes we make up the problems, other times we get them from books or websites. Recently we’ve been enjoying puzzles from Mindbenders and Brainteasers and Primary Grade Challenge Math. Next year I’m planning to add in the Murderous Maths series and a few other Rob Eastaway books, and I’m sure many more will make their way onto our shelves. This term we’ve learned about circles and measuring angles with the Sir Cumference series. I have several more of these on our shelves, which we’ll use as a springboard for more geometry play next year. We’ll no doubt review and extend our investigation of Fibonacci, perhaps using Wild Fibonacci. We’ll also continue to try out games we find online, like Contig Jr and make up our own games using a hundred chart. Maths is very hands-on round here. Some days we get out our tangrams, pattern blocks, Lego, metre ruler, compasses, measuring cups or weighing scales and just play. I’m looking forward to sharing more of our living maths adventures over the next year. What maths fun do you have planned?